Brainstorming ideas for your Facebook content calendar can be a daunting task, especially without inherit creativity. Heck, it would be fun if you had the time too right? We've received a ton of feedback from our clients and their two biggest struggles with Facebook posts were creativity and time. 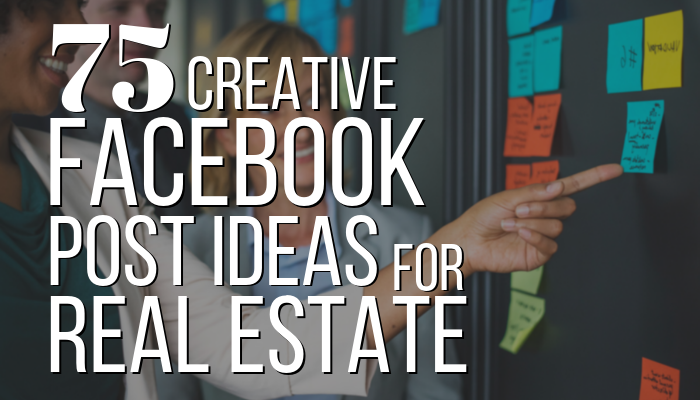 So, to help get the creative juices flowing and to help you save time, we've created a list of 75 creative Facebook post ideas to help you increase engagement, initiate conversations, enhance branding, and generate leads. Perfect for networking, congratulating, and recognition, shout out posts give you the opportunity to tag someone. PropertyPulse engagement posts typically have Holiday’s covered. However, PropertyPulse likes to stay neutral on religious holidays. Be sure to login and check your posting schedule to see what is coming up that month and revise to meet your personal reference! Valentine’s Day – Whether you love people, your pets or your home, be sure to spend time with the things you love! First Friday of March National Salesperson Day! How will you celebrate the new year? Helps drive traffic to people in your network. If they gain a client through your business recognition posts, they will be more likely to reciprocate and recommend you to their customers. Who is your trusted and reliable mechanic? Who does your taxes? CPA? Celebrate your accomplishments! Share your struggles! Consumers love a good story especially those with ups and downs. Readers will get to know you as you post about yourself, creating a relationship with you. The effect is that people will feel like your friend when they meet you for the first time. Which of your homes that you sold that year is your favorite and why? What are FAQ questions your clients ask you? What are FAQ your buyers ask you? What are FAQ your sellers ask you? Do you support or donate to a good cause? Show your expertise of the local area by posting recommendations of places of interest. A more up-to-date of showing off your expertise of the local area, recommending activities and other events will have your audience coming back for more information. The more they visit your page, the more likely they are to do business with you. What is the best kept secret in your city? Where is your favorite place to hang out? Routine | Example: Do you go to church? Which church do you go to? Where is a good place to purchase furniture? Where is a good place to purchase appliances? When/where are the farmers markets? With these Facebook post ideas, you will have the guidance to create engaging posts. You can always recycle these posts by tweaking and posting them again; consolidate and re-purpose them into blog posts or pages for your website, or personalize them more so they speak to a niche audience!